Budget Reconciliation - What is it and Why does it Matter? The budget reconciliation process requires the adoption of a congressional “budget resolution,” a concurrent resolution adopted by the House and Senate that is binding on the two legislative bodies and does not require a Presidential signature. The Federal budget process was created in 1974 with the goal of assuring effective congressional control of the budget process and providing for annual determinations of the appropriate level of Federal spending and revenues. Government spending is divided into two categories: “discretionary spending” that must be appropriated by Congress each year to fund government operations and “mandatory spending” in programs such as Social Security, Medicare, federal civilian and military retirement, food stamps and unemployment compensation. Congress typically begins formal consideration of the budget resolution once the President submits to Congress his budget request, which normally occurs in early February. While the Budget Act of 1974 requires Congress to complete action on the budget resolution by April 15, Congress rarely meets that deadline. The budget resolution sets forth a budget process that establishes the framework for subsequent spending and revenue-related legislation for the following fiscal year and for the 10-year budget window that begins with the next fiscal year. Early in 2015, Congress will begin consideration of a budget resolution for Fiscal Year 2016, which begins on October 1, 2015. The adoption of a budget resolution provides the opportunity for the House and Senate to utilize the “budget reconciliation” process to pass legislation that might otherwise be filibustered in the Senate. This process was created in the Budget Act of 1974 to expedite consideration of legislation to reduce the Federal budget deficit. Budget reconciliation has been used as the vehicle to enact many of the major mandatory spending and revenue laws adopted during the past 40 years: since 1974, Congress has passed 24 budget reconciliation bills with 20 signed into law and 4 vetoed by the President. Budget reconciliation is designed to make changes to mandatory spending programs, revenues and the public debt limit. However, budget reconciliation may not be used to make changes to the Social Security program or the taxes used to fund that program. 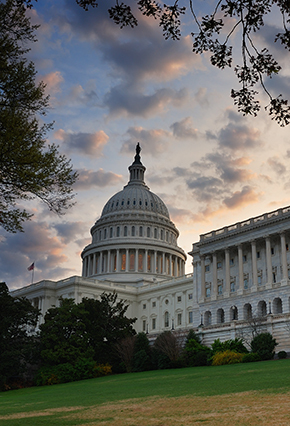 In addition, budget reconciliation may not be used to make changes to programs that utilize discretionary spending funded through the appropriations process. The budget reconciliation process begins with the inclusion of “reconciliation instructions” in the budget resolution. Reconciliation instructions require authorizing committees with jurisdiction over mandatory spending and revenue policies to make legislative changes in the programs they oversee to produce a specified level of budgetary savings, which may be achieved by cutting spending or raising revenues or both. Reconciliation instructions can also require tax reductions. The instructions typically cover the same fiscal years as the budget resolution, with separate dollar amounts specified for each of the years covered by the budget resolution. The House and Senate Budget Committees develop these instructions based on policy assumptions for changes in programs and laws (which are often printed in the committee reports contained in the budget resolution). However, the authorizing committees have complete discretion over the specific programs to be changed and the substance of those changes. An authorizing committee must only meet the specified spending and/or revenue directive it receives through the budget resolution. The budget resolution normally includes a timetable by which the authorizing committees must report legislation that meets these savings targets. The authorizing committees with instructions generally hold hearings and mark-up legislative provisions that are then returned to the House and Senate Budget Committees. The Budget Committees package the reconciliation provisions from the appropriate authorizing committees into one piece of legislation. When the budget reconciliation legislation is considered by the United States Senate, debate on the legislation is limited to 20 hours and it is protected from filibuster. Thus, a reconciliation bill needs only a simple majority to be approved, not the supermajority of 60 votes required to overcome a filibuster. Because reconciliation is such a potent legislative tool, the use of this process is limited by rules in the Budget Act designed to prevent extraneous provisions (in general, those that do not have an impact on the budget deficit or that increase the budget deficit outside the ten-year budget window) from being included in reconciliation bills. This rule, known as the “Byrd Rule,” is a powerful mechanism for limiting the policy provisions that can be included in a reconciliation bill because it takes 60 votes to waive the “Byrd Rule” in the Senate. Even with this rule, numerous major policy changes have been enacted under reconciliation: for example, portions of the Affordable Care Act and the 2001 and 2003 individual tax rate reductions (that were written to expire at the end of the ten-year window to avoid triggering the limits of the Byrd Rule) were enacted through budget reconciliation. Once the House and Senate have passed their separate versions of the budget reconciliation bill, the bills are sent to a House/Senate Conference Committee, made up of members of the Senate and House Budget Committees and the committees that received reconciliation instructions under the budget resolution, to reconcile the differences between the two bills. The budget reconciliation bill that is reported by the Conference Committee must be approved by both the House and Senate. In the Senate, debate on the Conference Committee bill is limited to 10 hours, and, since the bill cannot be filibustered, only a simple majority vote is required for approval. If passed by both houses of Congress, the bill would then move to the President for his action. As mentioned earlier, the President retains his authority to veto a reconciliation bill he opposes. Republican control of the House and Senate in the 114th Congress should make it easier for Congress to enact a budget resolution. The differences in budget policy goals between the most conservative House Republicans and the more moderate Senate Republicans and within the Republican majorities in both Houses of Congress may make it difficult for the House and Senate, at least initially, to agree on a budget resolution. If the Republican majorities in the House and Senate are able to agree on a budget resolution that includes reconciliation instructions, then the budget reconciliation process will be available to address a wide range of policies the Republican majority in Congress would like to present to the President. Some of the policies that could be addressed through this process include tax reform, the public debt limit, the Affordable Care Act, Medicare/Medicaid reform, and opening the Arctic National Wildlife Refuge to oil and gas exploration and development.